An ultra-luxury apartment with a sea view at Sentosa Cove has made the largest loss in the property market so far this year. Originally bought for $11 million in 2011, the condominium unit at Seascape was sold for $6.35 million in October at a loss of $4.65 million. A high-end property at The Ritz Carlton Residences in Cairnhill Road made the second-largest loss-making deal of $3.7 million in March. Another Sentosa Cove unit at Turquoise came in third, in a transaction that made a loss of more than $3.3 million in June. Statistics from property portal SRX show that sales of condo units with losses of more than $1 million each rose substantially this year, with 48 such transactions, compared with 31 in 2015. Most of these luxury homes were bought during the property boom years of 2007, 2011 and 2013. Up to November this year, more than 800 transactions involving non-landed private properties were loss-making, double the figure in 2015. There were nearly 6,000 resale non-landed private property transactions in the first three-quarters of this year, Urban Redevelopment Authority (URA) statistics show. Analysts told The New Paper that "unprofitable" deals are common in a cyclical downturn where market sentiment and employment prospects are poor. Expectations of a US Fed rate hike by the end of the year, which would increase interest rates here, are also driving these loss-making sales. R'ST Research director Ong Kah Seng said: "It is easy to advise people to avoid buying when there is a property bubble but in reality, people tend to avoid buying property only when there is a slump because they lack confidence." The high-end property market, buoyed by luxury home collectors in the mid to late 2000s, is losing its appeal because of the sluggish market, he added. Interested parties now are cash-rich buyers from developing Asian countries who would usually avoid splurging on the luxury market but are now looking for a good deal. Mr Ong said: "In the past, these properties were a status symbol. The more expensive it was, the higher its value. (Their losses) can be justified by the enjoyment and prestige of occupying these properties for the past couple of years. "Besides, they would have paid a certain price if they had rented them." Mr Desmond Sim, CBRE head of research for Singapore and South-east Asia, thinks some of these "bold" multi-million losses are paper losses, which are mitigated by foreign exchange in light of the strong Sing dollar. "A $2-million loss could also be considered 'manageable' if it means they can unlock $10 million in a more profitable investment elsewhere," he added. 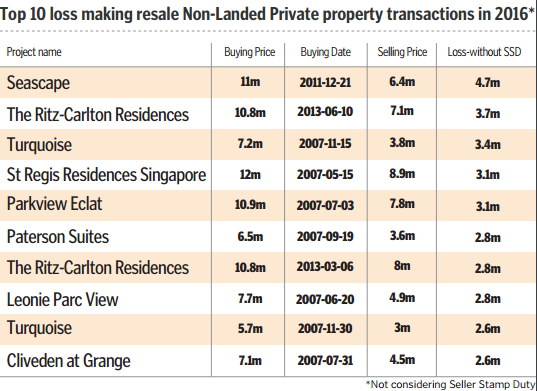 The top-10 loss-making properties are in two affluent neighbourhoods, Sentosa Cove and the Central area. All of them were bought during the property boom years in 2007, 2011 and 2013. Seven were bought in 2007. R'ST Research director Ong Kah Seng said: "Interest in the high-end segment was at the peak then because of the exciting plans that were announced at that time - such as the integrated resorts, plans to transform the Central Business District - which attracted many foreigners to have a stake in the hype." Massive loss-making property deals have made the headlines in recent years. Last year, a Japanese tycoon made an eye-popping S$15.8 million loss on a penthouse unit at St Regis Residences.The Monetary Authority of Singapore, in its Financial Stability Review released last month, warned property investors to be aware of rising vacancy rates, declining rentals and impending interest rate increases. These factors mean they may not always be able to rely on rental income to service their investment property loans. CBRE's head of research Desmond Sim said: "The slew of government policies (such as the Total Debt Servicing Ratio and Additional Buyer's Stamp Duty) are put in place to ensure investors don't bite off more than they can chew, or they will choke. "Those who made such huge losses are not in need of a Heimlich manoeuvre, but they are spitting it out now."